UMPEMB - Home – Universal Music Publishing Editio Musica Budapest Kft. Sign up to receive the UMPC newsletter. Four months after its premiere in La Scala, on March 6, Kurtág’ Fin de partie was revisited in the Dutch National Opera. The cast was identical with that of the world premiere: Frode Olsen (Hamm), Leigh Melrose (Clov), Hilary Summers (Nell) and Leonardo Cortellazzi (Nagg); the Nederlands Radio Philharmonic Orchestra was conducted by Markus Stenz, the performance was directed by Pierre Audi. In 1933, at the time of the Great Depression, Hungarian musician Rezső Seress wrote the hit Gloomy Sunday, which soon became world famous. In connection with the adhering urban legends, the song is known as a Hungarian Suicide Song. The title of this song was borrowed by Gergely Vajda’s new orchestral composition, which was premiered on February 11 by the Hungarian Radio Symphony Orchestra in the Grand Hall of the Budapest Academy of Music. Whether the variations borrowed more than the title, the opinions were divided after listening to the new work. The author says, “all the sounds and chords come from the original Seress melody and its most common harmonization,” but actually it is not easy to recognize them. “As a starting point for my work,” Vajda continues, “I was looking for a ‘standard,’ as jazz terminology would call it, which is known worldwide but is also Hungarian-related, and whose melody is familiar to the listener, even if they cannot name the title or the author. However, the famous, notorious hit of Rezső Seress does not appear in its entirety in my piece, so the audience is constantly forced to search for it, which, I hope, turns the process of listening into a game in the noblest sense of the word. On 16 February, Ensemble intercontemporain premiered Máté Bella’s Hesperus for viola and chamber ensemble at Radio France's Présence Festival. The composition was commissioned by EIC, soloist was Odile Auboin, the concert was conducted by Dylan Corlay. The model for the Wolf-temperiertes Klavier, as the title might suggest, is Johann Sebastian Bach’s keyboard cycle Das Wohltemperirte Clavier. In line with this, Péter Wolf’s collection of 24 piano pieces uses each of the twelve notes of the octave from C to B as home keys (both major and minor) for the movements. It differs from the Bach work in having no fugues, only freely composed praeludia, or as Chopin would have called them, preludes. Péter Wolf is more strongly linked to Chopin and the Romantic and twentieth-century prelude tradition he engendered than directly to Bach, insofar as etude-like virtuoso movements are interspersed with meditative, sentimental pieces in a series that takes us through the world of 24 keys, and the piano technique required is closer to the age of Romanticism than to the Baroque. Universal Music Piblishing Editio Musica Budapest is proud to announce the release of the extended and revised edition of Zoltán Kodály: Choral Works for Mixed Voices. Seventy-five years after their first release, the time has come for Kodály’s collected choral works for mixed voices to appear in a completely new, expanded edition. This collection contains six compositions that were not included in earlier editions. It is printed in a slightly larger format than previous editions and is available in a hardcover version as well as a softcover version for practical purposes. We whole-heartedly recommend the canvas-bound edition to libraries, collectors, and Kodály enthusiasts alike. This is the most complete and most authentic collection of Kodály’s mixed choruses to date, and it contains new easily-legible music scores and an informative epilogue written by Péter Erdei. More information on the publications can be found here. On November 15, Teatro alla Scala premiered György Kurtág’s opera Samuel Beckett: Fin de partie, scènes et monologues. In the long-awaited opera Kurtág set Beckett’s drama, which he had seen as a theater performance in 1957 in Paris. The textbook was compiled by the composer, using about half of the playwright’s play, strictly following the process of the drama. The cast of the world premiere included Frode Olsen (Hamm), Leigh Melrose (Clov), Hilary Summers (Nell) and Leonardo Cortellazzi (Nagg); the orchestra of La Scala was conducted by Markus Stenz, the performance was directed by Pierre Audi. The performance was created as a joint production with the Dutch National Opera, and further performances will be shown in Amsterdam on March 6, 8, and 10, 2019. This year, the 27th Milano Musica Festival – connected to Kurtág’s opera Samuel Beckett: Fin de partie, to be presented at La Scala on November 15th – focuses on the oeuvre of György Kurtág. From October 21st to November 26th, 22 concerts provide an overview of the composer's work: instrumental and vocal pieces, chamber and orchestral music. The festival presents Kurtág's conversations with his forerunners and contemporaries (Bach, Schubert, Bartók, Stravinsky, Ligeti) and the emergence of important topics of modernity in his art. In connection with the opera, special attention is paid to the works related to Beckett's writings, such as What is the Word or Pascal Dusapin’s Watt for trombone and orchestra. Gergely Madaras with the Kurtág-couple and György Kurtág Jr.
At the opening concert, La Scala's orchestra was directed by Gergely Madaras. György Kurtág Jr., who also played on synthesizer, presented Zwiegespräch, written together with his father; the original string quartet parts of Kurtág have been set for orchestra by Olivier Cuendet. In this composition – as one of the critics claimed – "two ways of thinking and performing music" came into dialogue with each other. Two days later Quartetto Prometeo performed Italian premiere of some compositions for string quartets (Secreta – In memoriam László Dobszay, Clov’s last monologue) besides Hommage à András Mihály – 12 microludes and 6 Moments musicaux. In the forthcoming concerts in November there come performances of such well-known compositions like Messages of the Late R. V Troussova (sung by Natalia Zagorinskaya, directed by Andrea Pestalozza) and rarely heard works, such as the choir compositions Omaggio Luigi Nono and the Eight Choruses to Poems by Dezső Tandori (the vocal ensemble Les Cris de Paris is directed by Geoffroy Jourdain). A vocal chamber concert with Sophie Klussmann encompasses almost four decades, presenting Seven Songs on poems by Amy Károlyi and Einige Sätze aus den Sudelbüchern von Georg Friedrich Lichtenbergs, followed by Scenes from a novel. Particular attention should be paid to the concert of the RAI Symphony Orchestra, in which Heinz Holliger conducts Stele and Pierre-Laurent Aimard presents the world premiere of some piano pieces from the forthcoming 10th volume of Games for piano. Three compositions by Gergely Vajda, Clarinet Symphony for two clarinets and orchestra, Alice Études for clarinet and string quartet, and Persistent Dreams for solo clarinet, have been recorded on a new CD, released by the Budapest Music Center Records. This offered the occasion to ask Gergely Vajda about his versatility. Clarinettist, composer, conductor – you have all these in your biography. Which is your priority order of these three “c”-s? I think creating something from nothing is probably the “king” of all activities, that’s how you can get closest to “Creation” as a human being. Alessio Elia was called "the rising star of a new generation” by Elena Abbado. Besides his Italian home country, Elia studied in Germany, Norway and Hungary. He has been supporting his composing activity with scientific research, which is related to different tuning systems that he labels as "polysystemism". His orchestral and chamber music works have been performed in many places and he has received commissions in Italy, Germany, Switzerland and Hungary. His Octet for wind instruments was commissioned by the wind ensemble of La Scala, Milan, and has recently been released on CD by Warner Classics. György Kurtág has barely written instrumental works for chamber ensemble, a formation otherwise favored by contemporary composers. Hence, the arrangements of the Swiss composer-conductor Olivier Cuendet from Kurtág’s emblematic collection for piano, Games, represent a significant enrichment of the repertoire. The sequence of 34 pieces can be performed consecutively as an inherent cycle or in different combinations. 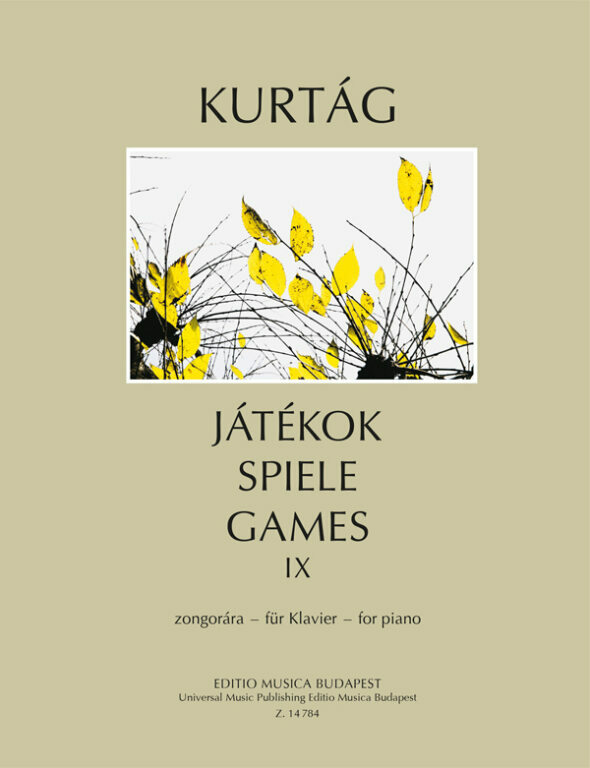 “The selection is highly subjective – writes Cuendet –, some pieces sounded orchestral already to me when I played them on the piano, others spoke to me through their simplicity or complexity.” These arrangements, authorized by Kurtág, use a flexible orchestration whose range reaches from 4-5 instruments up to a full ensemble of ca 15 musicians. Universal Music Publishing Group is pleased to announce that the printed music publishing and distribution business of its Hungarian affiliate Universal Music Publishing Editio Musica Budapest Zeneműkiadó Kft. has been transferred to a new entity, Editio Musica Budapest Zeneműkiadó Kft. EMBZ will be owned and managed by a group led by UMPEMB Director of Printed Music László Sigrai. Long-time UMPEMB Managing Director Antal Boronkay will also participate in the direction of EMBZ. EMBZ will distribute all existing UMPEMB printed music products, and will work closely with UMPEMB to continue to develop new high-quality printed music products in both physical and digital form for the educational and performance markets. EMBZ will also continue to distribute sheet music products of other publishers. The piano series entitled Games, written from 1973 onwards, was conceived originally as a piano method. Its early volumes introduced children to the basic elements in piano-playing and musical thinking, and, more importantly still, taught them to play music without inhibitions. As the years went by, the view of the series lost its didactic character. It came to be seen as a document from Kurtág’s workshop, offering a key to his grander symphonic, chamber and vocal works as well. This change is exemplified in the subtitle Diary entries, personal messages added from the fifth volume onwards. The pieces in the ninth volume date from 1989‒2009, except the youthful Apple blossom, written in 1947. The movements, often aphoristic in their briefness, conceal associations with various aspects of European music history. Many of them are hommage or in memoriam pieces, or subjective personal messages to friends, colleagues, beloved family members or students, and thereby to all music-loving people. The beginning of Máté Balogh’s, Máté Bella’s, Péter Tornyai’s and Balázs Horváth’s musical career is in many ways tied to Péter Eötvös, who was their driving force in the past few years. It is therefore no surprise that the majority of the programme of the Peter Eötvös Contemporary Music Foundation’s (which Eötvös founded in 2004) concert in Zurich on 26 June consists of works composed between 2010 and 2016 by these young composers. Jam Quartet by Máté Balogh, Chuang Tzu’s Dream by Máté Bella, QuatreQuatuors by Péter Tornyai will be performed for the first time in Switzerland, pikokosmos = millikosmos by Balázs Horváth will be premiered in Zurich. The audience in the Tonhalle will hear the music of three generations. Apart from the Swiss premiere of Eötvös’s da capo (Mit Fragmenten aus W. A. Mozart’s Fragmenten), Kurtág’s Brefs Messages will also be performed. The program is conducted by Eötvös himself, performed by the THReNSeMBle, the ensemble of the Contemporary Music Foundation. The Frankfurt Radio Symphony will perform a program of Hungarian compositions on 5th May. The title of the concert is 'Eötvös’ Ungarn', and it is a part of the three year cooperation in which Péter Eötvös participates as curator in the work of the orchestra. The programme includes József Sári’s Concertino for orchestra, Levitation for two clarinets, accordion and strings by Péter Eötvös, Passacaglie for viola and orchestra by László Tihanyi and Drums Drums Drums for timpani, drumset, bass drum and orchestra by Gergely Vajda. The last two works were recently published by Editio Musica Budapest. Vajda Gergely is a part of the programme not only as a composer, but he is also going to make his debut as conductor with the Frankfurt Radio Symphony. The concert is going to be recorded and broadcast by Radio Hr2 on 16 May 2017.